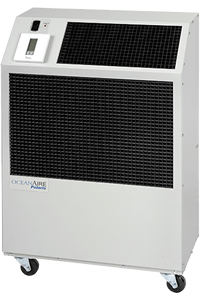 OceanAire’s water cooled portable air conditioner units offer an extremely efficient and effective way to control the climate in any sized room. Because water cooled air conditioners do not discharge large amounts of heat, they do not require exhaust ducting and are used to great effect in enclosed areas. 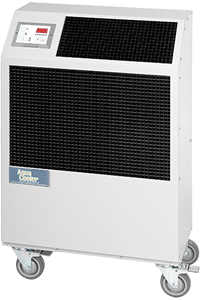 How Do Water Cooled Portable Air Conditioning Units Work? Portable air conditioner units that are water cooled simply require access to an appropriate power source, a source of water and a drain. Our units come equipped with hoses which will connect to any standard sink, but can also be used in janitor sinks or used with any other type of waste water outlet. There are many applications where a standard air cooled air conditioner cannot be used. Because they require ventilation to discharge the heat that they generate, ducts must be run through windows or into floated ceilings or other appropriate outlets, like a warehouse or other large spaces. This makes water cooled air conditioners far more versatile than air cooled portable air conditioners. Just released New Redesign 5-ton PWC series. Same performance in a smaller cabinet! All OWC models come with a 10-foot power cord for electrical connection and added mobility in service. These spot-coolers are designed to direct air to specific areas or objects through a discharge grill located on the upper-front of the unit, while rejecting heat from the top of the unit. The OWC models range in cooling capacities from 12,000 BTU/HR to 60,050 BTU/HR to satisfy most space cooling requirements.